I didn't include Shmooie's input, because it has been in the form of a request rather than a guess. I also considered doubling the guesses of my two siblings, except they cancel each other out. There is still time to guess (up to May 7! ), so if you haven't already done so, feel free. I can revise as needed. Also, if you want more immediate results for a guess, surf on over to the kilowatthour. She already knows what she's having, but she hasn't revealed it yet. She also found some funky ways to get results. From her links: On the Chinese conception chart, my result is boy. 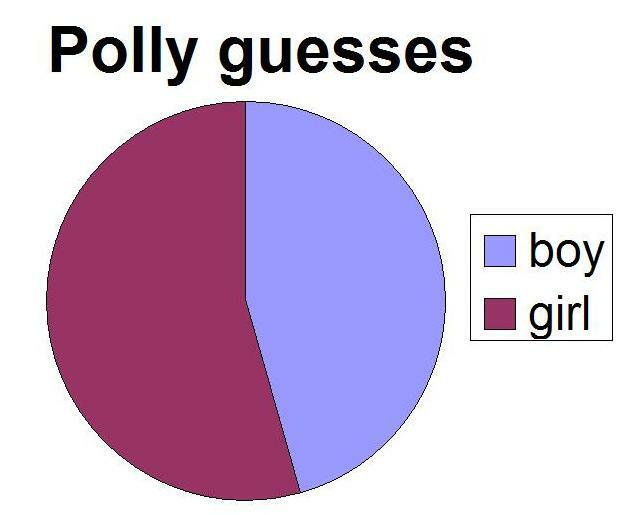 And this test says 60% chance of boy and 39% chance of girl (and what is the remaining 1%, I'd like to know), although it's a dumb test overall. Some babies are born with variant sexual development that cannot be neatly classified as "boy" or "girl." Maybe about 1%. See http://en.wikipedia.org/wiki/Intersex for more info. Mostly silly with a chance of insightful. Leethrash: Hope all goes well, friend.